As an Oriflame Consultant you will have access to a wide variety of support material to help you make your business a success. We’ll support you every step of the way with a thorough training, inspiring catalogues and information about the latest beauty trends. 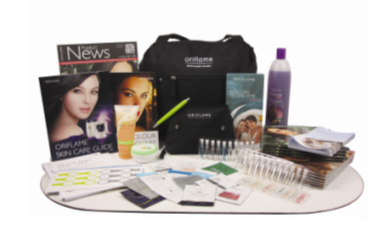 Claim your Oriflame business bag today! The Oriflame Business bag contains a variety of fragrance samples and two full size products and every thing that you need to get going . Although there is no start-up fee, The Business case is £20.00 and you decide if you would like one or not~ If you do want the case please use code 480903 when ordering . I totally recommend this kit as it has every thing that you ever wanted and puts you on the right foot to get going . so whats in the kit ?